France 1831: In a remote corner of Ardeche, the little village of Peyrebeille sees numerous travelers pass through... A family of greedy rural farmers is determined to make its fortune, and has devised a diabolical stratagem to achieve this goal: Invest in an inn so they can rob traveling guests, getting rich without arousing the suspicions of the police! 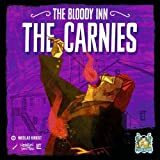 Whether or not their plan will work out, one thing is certain: Not every guest will leave this inn alive. In this family, it's every man for himself! At the end of the game, there will be a final tally: The richest of the innkeepers will be proclaimed victorious! Give each player two Peasant cards and one Player Aid card. The peasants form your starting hand. Place your Player Aid card on the table, in your play area; it also serves as a barn. 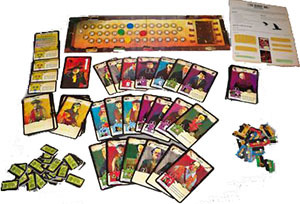 With fewer than 4 players, leave the unused Peasant and Player Aid cards in the box. Build the Traveler deck: Depending on the number of players and the length of game you wish to play, you will put a certain number of cards back in the box, without looking at them. 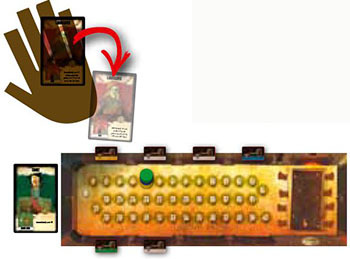 Shuffle the rest of the cards to form a deck, and place it at the entrance to the inn, at the left of the board. Place the cards so the Living side is visible. These cards form the Entrance Stack. Each player chooses a player color and receives the 8 Key / Room Service tokens and the disc of that color. Place your disc on the 5F space of the Wealth Track on the Inn board. Each player takes one 10F Check tile. The other Check tiles form a supply near the gameboard. Each player places a Key token of his color on an unclaimed room of his choice (the position of the room makes no difference, so just choose a room close to you). In a 2- or 3-player game, place a Key token of the neutral color on each of 3 doors of the inn. 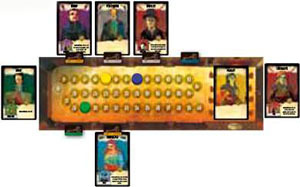 In a 4-player game, place one on each of 4. The greediest player takes the First Player card (as everyone knows, the greediest person is the one with the most coins in his pockets!). The game is divided into two seasons and a variable number of rounds. During the first season, travelers arrive at the entrance to the inn for the first time, and the lucky ones will continue their trek. They will be in the entrance stack for the second season. Each round is divided into 3 phases: welcome travelers (evening), player actions (night), and end of round (morning). Draw the top card from the Entrance Stack (making the second traveler of the stack visible). Place the traveler in an open (i.e. has a Key token), unoccupied (i.e. has no traveler) room of his choice. Reiterate this process until there is a traveler in each open room. Note: the first time the Entrance Stack becomes empty, shuffle the cards of the Exit Stack in order to form a new Entrance Stack. The second time the Entrance Stack becomes empty, do a normal final round, even if the inn is not completely full (Exception: Don't play the final round if there are fewer travelers in the inn than the number of players). Example: In a 3-player game, Anna is responsible for greeting the travelers because she is the first player. She takes the first card of the Entrance Stack, the landscaper, into her hand. She chooses to lodge him in the yellow player's room. Anna greets the next 5 travelers in a similar fashion in order to fill the 6 open rooms of the inn. Starting with the first player, then going clockwise, each player performs a first action. Then, each player in turn must perform a second action. When you take one of these actions, you choose a Guest card in play (in your hand or in the inn, as appropriate). You must play a number of cards defined by the rank of the chosen card. Then, you reclaim any cards you played that have an aptitude for the chosen action; you lose the other cards. This action allows you to take a Guest card from the inn into your hand. 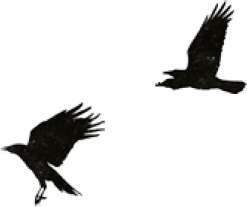 Guests in your hand are your accomplices, who will help you in your macabre enterprise. Select the Traveler you want to bribe from among those renting rooms at the inn, regardless of who owns that room. Play on the table as many Guest cards from your hand as the rank of the Traveler you just chose (e.g. 0 cards for a rank-0 Traveler; 3 cards for a rank-3 Traveler). From the cards you just played, return cards with the icon to your hand (these guest have an aptitude for the Bribe action); put the other cards in the Exit Stack. (Exception: If you played any Peasants, put them in the bistro of the inn, instead of the Exit Stack). Add the bribed guest to your hand. In the same way, it is possible to bribe the peasants that are in the bistro. If you choose to bribe peasants, you can take one or two (your choice: it is easier to corrupt peasants!). Peasants are rank 0, and thus do not require playing any cards to bribe them. Example: Anna wants to bribe the rank-3 landscaper in Madeline's room. To do this, she plays 3 cards from her hand 1. The peasant returns to the bistro because peasants always return to the bistro. 2 The novice continues on his journey because he has no aptitude for bribery 3. The newsboy returns to Anna's hand because he has an aptitude for bribery. 4 Anna then takes the landscaper into her hand as an accomplice. Note: Your accomplice has allowed you to build this annex, but you won't be able to count on his abilities thereafter, because he is too busy! Choose a Traveler card from your hand that depicts an annex. Play on the table as many other guest cards from your hand as the rank of the card you chose. From the cards you just played, return cards with the icon to your hand (these guest have an aptitude for the Build an Annex action); put the other cards in the Exit Stack. (Exception: If you played any Peasants, put them in the bistro of the inn, instead of the Exit Stack). Place the Traveler card chosen in front of you on the table, with its Living side visible; this now becomes an annex. There is no limit to the number of annexes you can have in front of you, and you can have several copies of the same annex. Note: Police and Peasant cards cannot become annexes (notice that there is no house icon at the bottom of these cards), so they cannot be chosen as +the target of the Build action. Example: Madeline wants to build the distillery associated with the distiller she has in her hand. Because the distiller is rank 2, she plays 2 other cards from her hand 1. The viscount continues on his journey because he has no aptitude for building annexes. 2 The mechanic returns to Madeline's hand because he has an aptitude for building annexes. 3 Madeline then places the distiller on the table, in her play area, as an annex. From now on, she can benefit from its effect. When you kill a Guest of the inn, you put him in front of you Dead-side-up. It pains you, but what can you do? This is the life you have chosen! Keep in mind that you have a code of honor: You only steal money from a Guest when you bury him! Select the Traveler you want to kill from the inn (in a room of your choice or in the bistro; it's possible to kill the Peasants). Play on the table as many Guest cards from your hand as the rank of the Traveler you just chose. From the cards you just played, return cards with the icon to your hand (these guests have an aptitude for the Kill a Guest action); put the other cards in the Exit Stack. (Exception: If you played any Peasants, put them in the bistro of the inn, instead of the Exit Stack). Place the Guest card in front of you on the table, with its Dead Guest side visible; this now becomes a corpse. 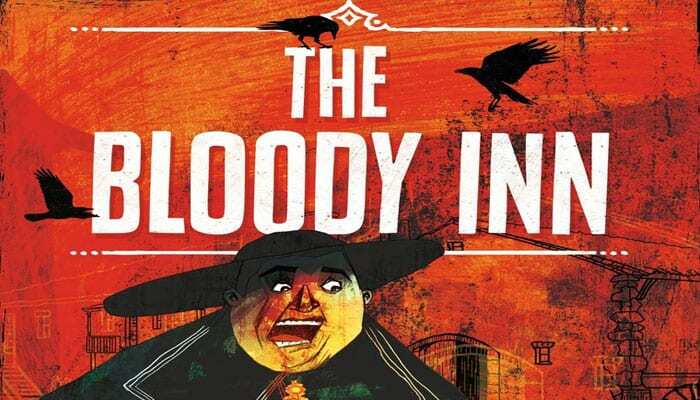 There is no limit to the number of corpses you can have in front of you, but watch out for the police! Example: Madeline wants to kill the baron in Anna's room. Because the baron is rank. Madeline does not need to play any cards in order perform this action 1. Madeline takes the baron and places him on the table, in her play area, with his Dead side visible. You can bury the corpse of a guest you killed in a previous action. Select the corpse you want to bury from among those in front of you. 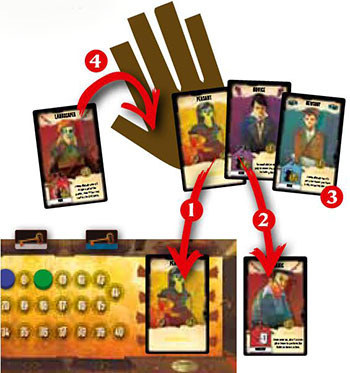 Play on the table as many accomplices as the rank of the card you just chose. 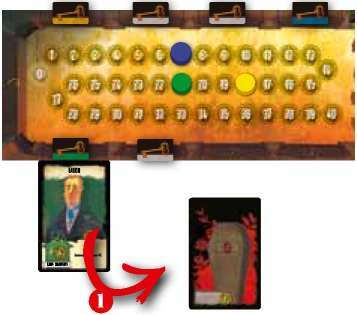 From the cards you just played, return cards with the icon to your hand (these travelers have an aptitude for the Bury a Corpse action); put the other cards in the Exit Stack. (Exception: If you played any Peasants, put them in the bistro of the inn, instead of the Exit Stack). Place the corpse card under an annex of your choice, regardless of who owns it, leaving enough of the card sticking out so that you can see the amount of money in the corpse's pocket. The number of bodies that can be buried under an annex is equal to rank of the annex (e.g. you can bury 2 corpses in a rank-2 annex, and no corpses under a rank-0 annex). You and the owner of the annex share the money in the corpse's pocket, by advancing your tokens on the Wealth Track (if you bury the corpse under one of your own annexes, you take all the money for yourself, of course). Note: It is possible to bury a corpse under the barn. Important: It is impossible to have more than 40 francs on the Wealth Track. If your earnings would take you over 40 francs, tough, you have nowhere to keep the excess! However, 40 francs is not the maximum score, as we will explain a little further below. 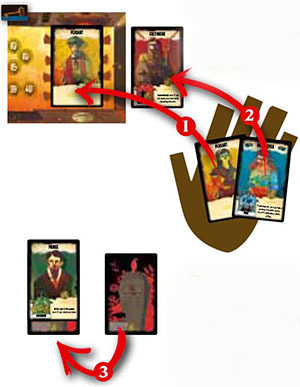 Example: In order to bury her rank-2 corpse, Madeline plays 2 cards from her hand. 1 The peasant returns to the bistro. 2 The grocer goes on the Exit Stack. 3 She slips the corpse under her own rank-3 annex, and advances her disc 18F on the Wealth Track. Exchange a portion of your cash for 10F Checks (for example, you can give up 20 francs on the Wealth Track to earn two 10F Checks). Cash Checks in order to increase your cash by 10 francs per Check. The end of the round is divided into 3 steps: police investigation, travelers leave, and pay wages. If there is at least one Police card in an open room at the inn, the police investigate! Each player having at least one unburied corpse must appeal to the village gravedigger, in order to avoid being arrested. Each player must pay 10 francs per unburied corpse he has, and then discard his unburied corpses (put them in the box). Note: You can pay the gravedigger with a 10F Check. If you are unable to pay the gravedigger, pay what you can with coins and checks, and the gravedigger will nevertheless assist you in getting rid of your corpses! What a guy! Each player earns 1F for each room of his color (i.e. each door with a Key token of his color) occupied by a Guest card. Note: The rooms that are open due to white Key tokens earn the players nothing. The inn is then emptied. Place all the Traveler cards from the inn rooms on the Exit Stack with their Living side visible. Each player must pay his accomplices: Move your disc back on the Wealth Track 1F per Guest card in your hand. Warning, your accomplices do not trust you enough to accept checks! Once you drop to 0 on the Wealth Track, you will have to let any unpaid accomplices go; place them on the Exit Stack (except for Peasants, who go to the bistro)! 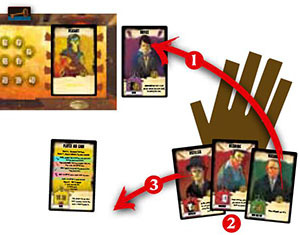 The first player gives the First Player card to the player on his left and a new turn can begin. Example: The players have done their two turns of actions. One Police card remains in the inn, which triggers a Police Investigation. Madeline, who still has an unburied corpse, must rely upon the services of the village gravedigger, paying 10F. Sebastien earns 2F because his 2 rooms are occupied. After having put the 4 Traveler cards remaining in the inn into the Exit Stack, each player pays 1F per Guest card in his hand. The second time the Entrance Stack becomes empty, finish the round, and the game ends. Note: Do not play the last round if there are fewer Travelers in the inn than there are players. In this case, put the rest of the Guests on the Exit Stack. Each player having at least one unburied corpse must appeal to the village gravedigger, in order to avoid being arrested. Each player must pay 10 francs per unburied corpse he has, and then discard his unburied corpses (to be paid with a check if needed). Evaluate the rank-3 annexes that earn you money. Note: Even now, you cannot have more than 40 francs on the Wealth Track! Calculate each player's booty by adding 10 francs per Check he has to his value on the Wealth Track. The richest player wins the game! In the event of a tie, the winner is the richest player who has the most corpses under his annexes. If there is still a tie, then the game ends in a tie, and you must play again! !